This weekend we held a goodbye party for the kids’ friends (and some of ours as well :). The children helped prepare adorable signs (“I love you.” “I will see you soon again!”) and we served Mango Lassi and a swiss cheese pie made with rice as the “crust” in honor of our planned travels. I was not sure what to expect — tears, difficult goodbyes, and worried children all seemed like possibilities. Leaving, in my recent experience, has always been a large permanent move (graduating from College, graduate school, moving from one coast to another, and so on). Not something to be taken lightly, but rather a time of tears and heartache mixed with excitement and planning. This time around it seems different … more reminiscent of going home for a summer. The children enjoyed every minute of the party and shed not a tear. 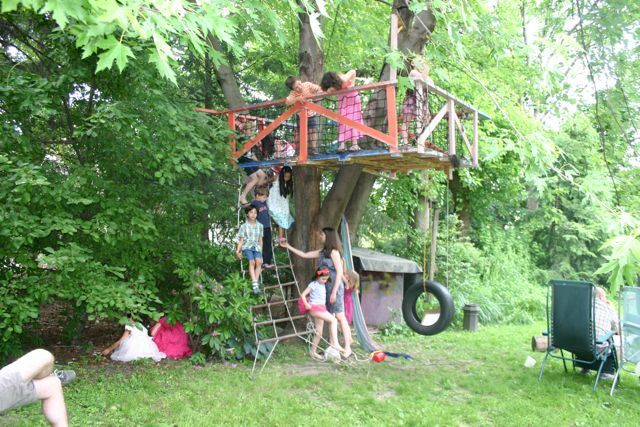 They swam in the pond, put up a “No Adults Allowed” sign on the treehouse, and generally owned the yard. Thanks to all our friends for helping create a wonderful collection of memories and photos that will carry us forward through the time away. Next PostNext On the road!